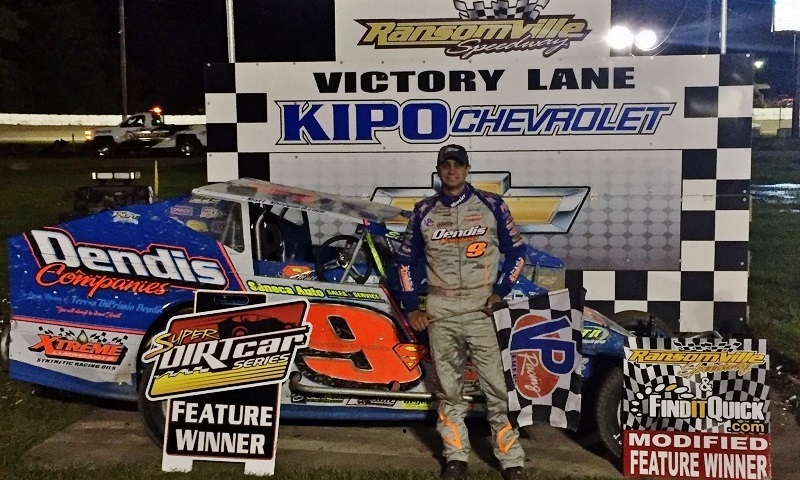 RANSOMVILLE, N.Y. — Matt Sheppard took the point from Billy Decker on lap 49 and led the remaining 52 laps to win his third straight Super DIRTcar Series race in Tuesday’s 33rd Summer Nationals at Ransomville Speedway. Sheppard was the third and final leader in the race and the victory was also his first career win at Ransomville, preventing rival Stewart Friesen from winning the event for the third straight year at his childhood track. Decker threw everything he had at Sheppard to try and retake the lead off the final restart with five laps to go, but fell 0.923 of a second short of a victory. Decker did manage to win an extended battle with Larry Wight to extend his point lead, which was just two markers entering the event. Ransomville regular Erick Rudolph and Friesen rounded out the top five. Over the final 52 laps, Sheppard pounded his No. 9s against the cushion in turns one and two, but tried both the inside and outside lanes in turns three and four as he navigated through the traffic. “It was a fine line up on the wall,” Sheppard said. “It was a little closer to the wall than I like to run, but that’s just part of the deal here at Ransomville. I’m just very fortunate. A lot of people got messed up on the bottom on restarts early, but my car was good enough early I could maintain and not lose any spots. It seemed like the longer the race went, the better we got.”Over the final 52 laps, Sheppard pounded his No.9s against the cushion in turns one and two, but tried both the inside and outside lanes in turns three and four as he navigated through the traffic. Wight jumped into the top-three off a lap 62 restart and then spent the better part of the final 35 laps dueling side-by-side with Decker for second. Wight lost the battle on lap 86 when he went off the track in turn two trying to avoid contact with a lapped car. It was the second time in the race Wight had to take evasive action to quickly avoid serious problems. Earlier in the race, he hit the outside wall and all but destroyed the body on the right side of the car. Regardless, Wight was happy with the run. Feature (100 Laps) – 1. 9s-Matt Sheppard ; 2. 91-Billy Decker ; 3. 99L-Larry Wight ; 4. 25-Erick Rudolph ; 5. 44-Stewart Friesen ; 6. 19-Tim Fuller ; 7. 88m-Mike Mahaney ; 8. 42p-Pat Ward ; 9. 42-Pete Bicknell ; 10. 21a-Peter Britten ; 11. 98h-Jimmy Phelps ; 12. 20-Brett Hearn ; 13. 38s-Ryan Susice ; 14. 6h-Max McLaughlin ; 15. 109-Billy Whittaker ; 16. 20m-Jeff McGinnis ; 17. 43-Keith Flach ; 18. 111-Allan Wills ; 19. 37s-Tommy Flannigan ; 20. 26-Rick Richner ; 21. 22-Brandon Walters ; 22. 8-Rich Scagliotta ; 23. 27-Jim Zimmerman ; 24. 56-Steve Schumacher ; 25. 21-Kenny Wills III ; 26. 7-Scott Kerwin ; 27. 11s-Steve Lewis Jr. ; 28. 55c-Steve Cotriss ; 29. 678-John Smith ; 30. 7m-Mike Maresca (DNS).